Items 253- out of displayed. USD index pull-back could be good for new longs on AUDUSD. USD remains clearly in a bearish mode across the board while the US bonds and now also US stocks are trading higher. However, current bearish trend of the USD could slow down for few sessions because of five waves down and oversold conditions. 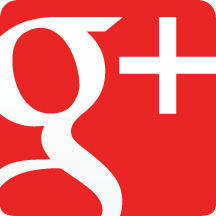 As such, traders need to be aware of a corrective rally in three legs. Once USD index will make that three waves up we will be interested to go long EURUSD with members. 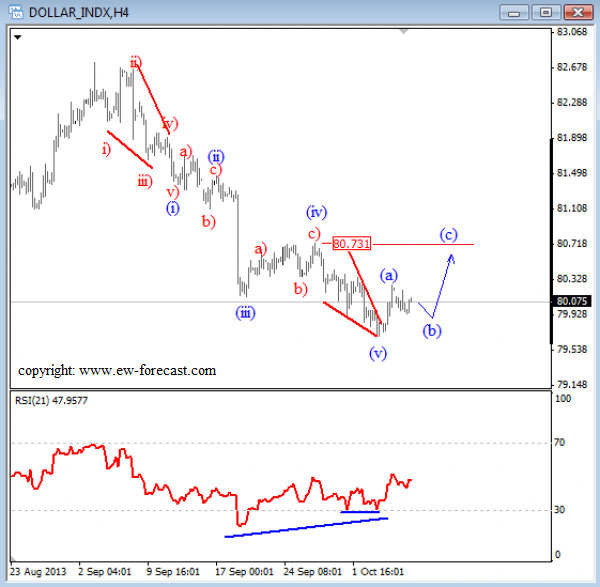 Few days back we published an article on our website and highlighted that we anticipate a rally on USD index in minimum three waves back to 80.73. In the next video we will look at some evidences and reasons why we turned up on the USD, and where prices could go from here. And more importantly, what we need to see to confirm further direction on USD Index. Somehow we favor more downside, but more about this in the video. On Friday we mentioned to our members that downside on USD Index is limited which has proved correct as prices are already recovering from latest low. In fact, recovery is not a surprise after five waves of decline, bullish RSI divergence plus an ending diagonal placed in wave (v). 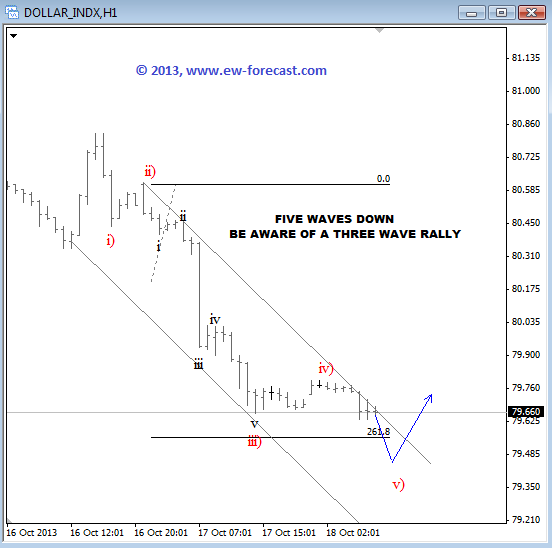 These are all important pieces that put USD index in a recovery mode, for a minimum three wave rally. This three wave rally, in (a)-(b)-(c) structure can reach 80.73 figure which was wave four swing high. German DAX futures are in bullish move since start of September, showing an impulsive price action. Impulse is a five wave pattern so we expect more upside as current decline from the highs appears to be only a fourth wave, a temporary contra-trend movement. For now, we don't see a completed pull-back yet, but market could find a support around 8510-8570 region where we see an open gap. Those gaps could react as a reversal, in our case as a support in wave 4 for a bounce back up into wave 5. 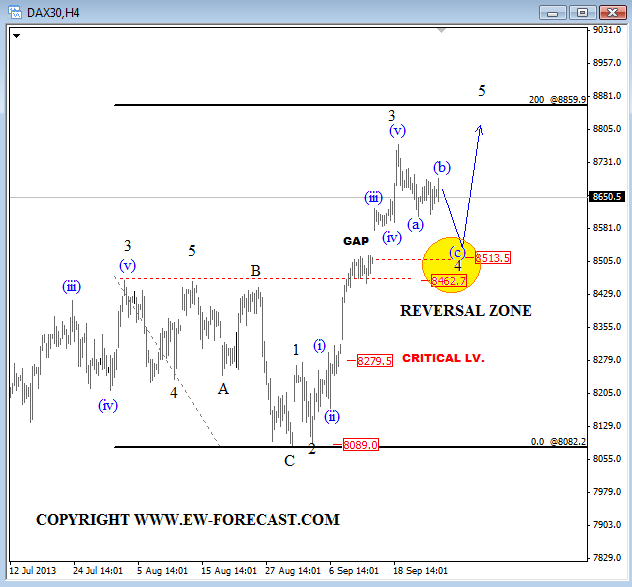 Targets for wave 5 would then be around 8860 where we see a 200% extension of a previous decline from 8460 to 8090 in August. Traders, I am observing a new very interesting bullish count for the EURUSD. I am tracking an impulsive move which has room for much higher levels and reason for this view is very simple; I just want to get involved if those breakouts and current direction (weak USD) is for real. With that said, I will keep an eye on pull-backs; that would be wave iv) that could start unfolding from around 1.3520-1.3585 wave iii) resistance area. 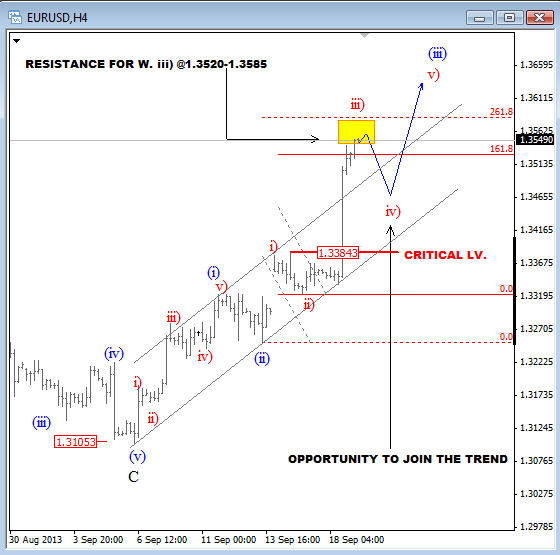 If this count is correct, then EURUSD should make a daily close around current levels (1.3500) or higher. Patience! 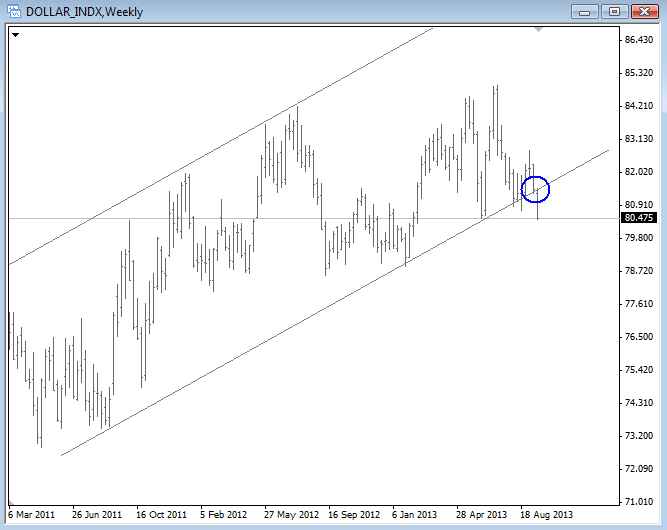 A broken support line on a weekly USD Index chart is the main reason why we favour USD Shorts at the moment. GOLD has turned bearish last week and made a sharp decline towards 1300 with a personality of an impulsive price action; strong and large move in the short period of time. As such, we believe that metal is in a new bearish period which could bring price even back to June lows. We will be looking lower as long as 1434 is in place. With that said, to take advantage of the current down move it’s important to keep an eye on intra-day wave patterns and any evidences of a corrective or contra-trend patterns that will give you an opportunity to join the trend. Well, on the hourly we see a sideways movement in tight range which is a very important guideline for a correction, or temporary pause within downtrend. 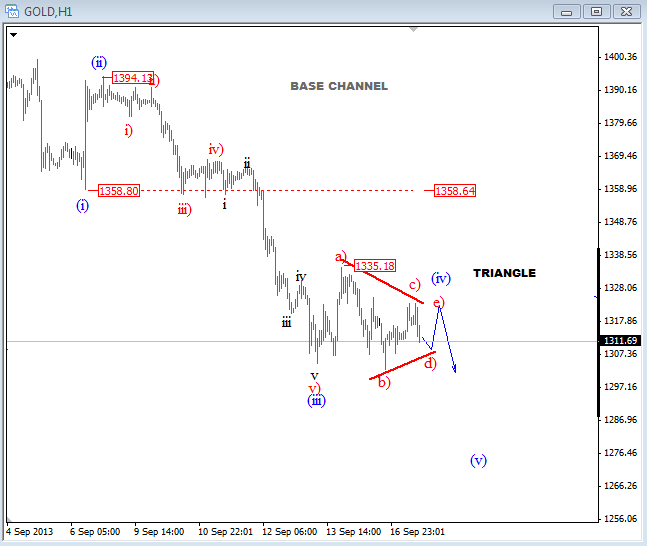 From an Elliott Wave perspective we see current pause as a triangle which is a continuation pattern, most likely placed in wave four. As such, we anticipate trust out of a triangle into wave (v) that could reach levels around 1280 in the next 24-48 hours once 1300 support is taken out.